This Season's Kitten Heels - My name is Lovely! So…. the Kitten heels, weather you love them or hate them they are one of this seasons must haves. 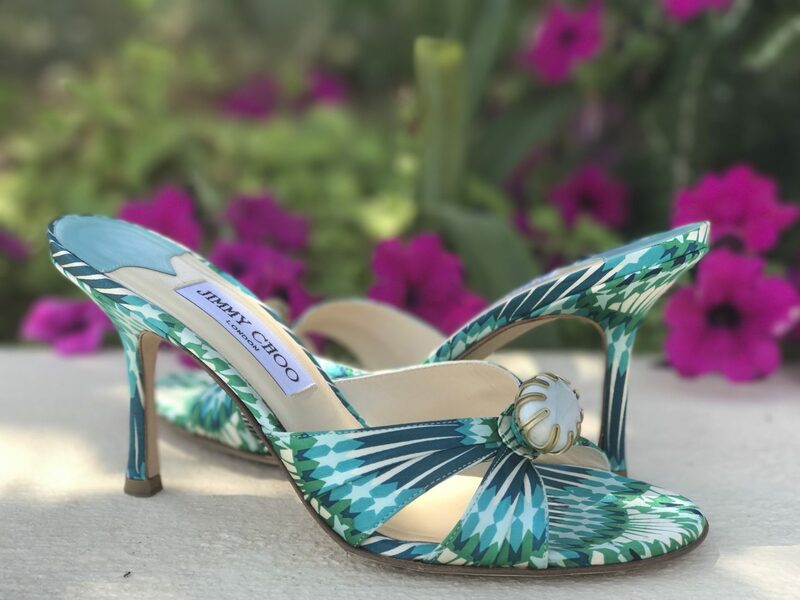 Like most of you out there I was not in favour of the Kitten heel to begin with, I only own one pair which are my Jimmy Choo ones which I bought years ago from Net-A-Porter. I couldn’t resist them as the colours on them were just gorgeous and I didn’t mind the shorter heels, they went perfectly with the dress I was wearing. I am more of a high heel kinda girl, but after seeing the endless variety of Kitten heels out there I have decided that I shall purchase a few more to add to my wardrobe. They are elegantly functional, as well as being very versatile. Try styling them with some straight-leg cropped jeans as low heels look good with them. Also works well with cropped flared trousers and an oversized shirts. How about styling them with a miniskirt in the sixties-style and a simple T-shirt tucked into your skirt. Also one of my favourite ways to style the Kitten heels is by pairing them with high waisted shorts, a body, a blazer and a cross body bag. This in my opinion is a clear nod to the Dior kitten hells. At a fraction of the cost, these are as stylish and gorgeous. Boasting a lacquered red finish these elegant patent leather kitten heels are elevated with pretty grosgrain bow appliques. 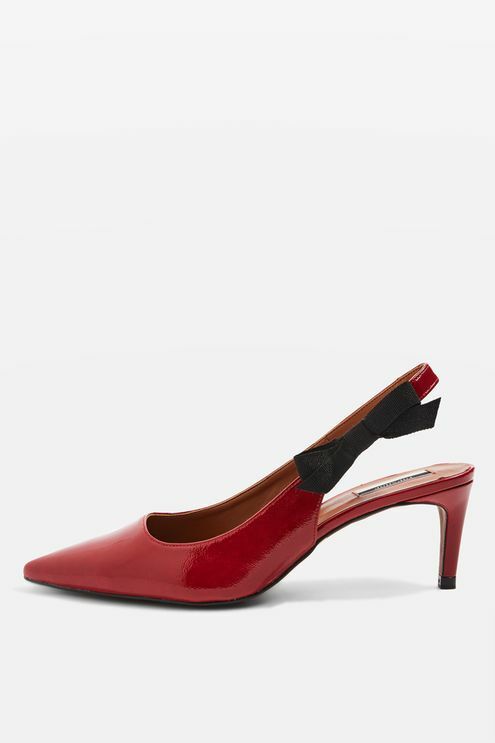 In a flattering slingback design, this feminine style is finished with a mid heel and pointed toe. The Heel height is approximately 2.5 inches. 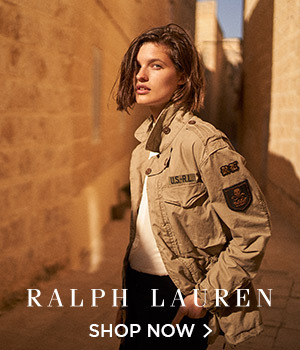 Would look great with a pair of black side stripe trousers, a oversized white shirt and a red cross body bag. These black mules are from Zara and look so cute, I had to include them on here. 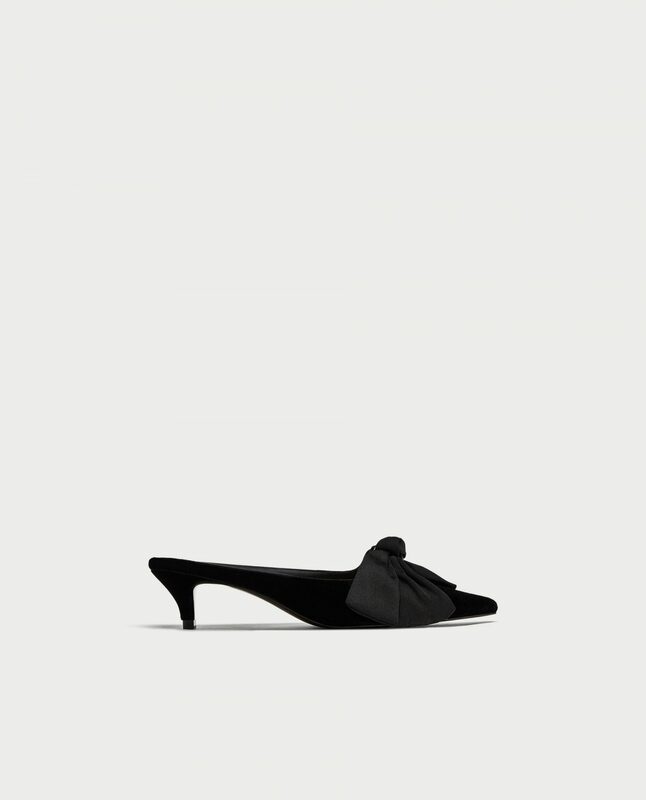 They have a black velvet bow in the front and pointed toes. The heel height is approximately 1.7 inches high. I would style them with a black tulle midi skirt, a white slogan T-shirt and a clutch bag. Christian Louboutin’s ‘Riverina’ pumps have a classic pointed silhouette and sheer mesh toe for a contemporary finish. Crafted in Italy, they’re intricately embroidered to give the illusion of lace and detailed with sleek leather trims. The heel height is approximately 2 inches high making them a comfortable choice for long days. They are made from black leather and mesh and have a buckle-fastening ankle strap. Love these so much and would be perfect for weddings styled with a 50’s style midi dress. Miu Miu’s interchangeable canvas ties have become a cult hit. 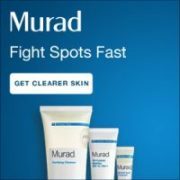 They can be coordinated, mismatched or detached completely to suit your outfit. These smooth leather pumps come with white and gingham versions and have a slim heel which measures approximately 3 inches. They tie at the ankle, and I am one for lace-ups just can’t get enough of them. Style them with other monochrome pieces. 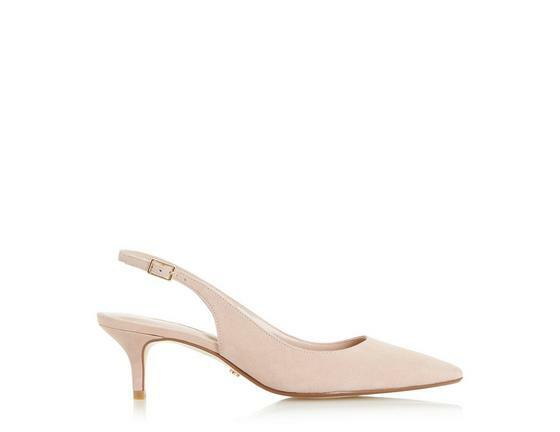 These blush suede kitten heels are just gorgeous in my opinion. Why not update your look this season with the Casandra kitten heel court shoe. 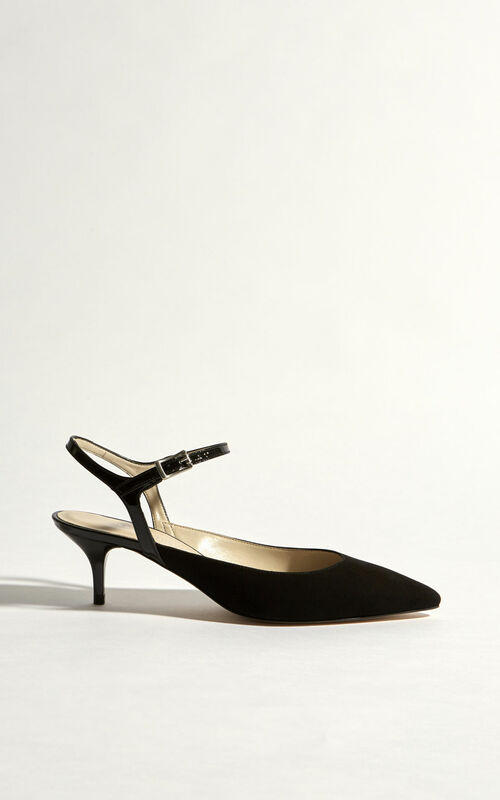 Featuring a pointed toe and a buckle-fastening slingback strap. The Dune branded stud on the sole is the perfect finishing touch. 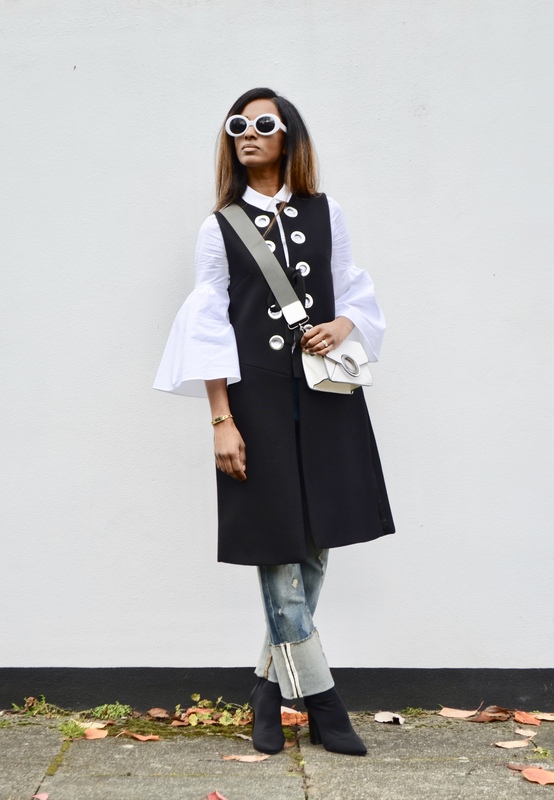 I would style them with a cropped wide leg trouser in a neutral colour, a black shirt or top and a shoulder bag. 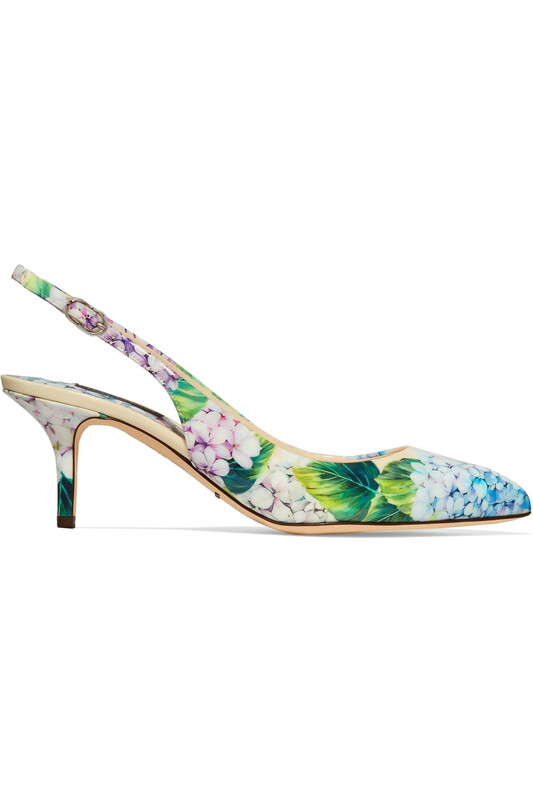 Dolce & Gabbana’s slingback pumps are printed with beautiful lavender and blue hydrangeas inspired by English gardens. 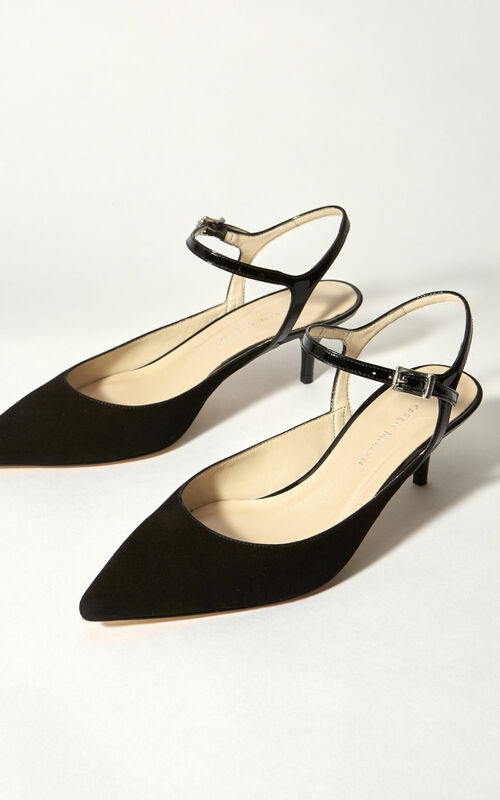 Made in Italy from glossed-leather, this pair has a classic pointed toe and a buckle-fastening slingback strap. The heel measures approximately 2.5 inches high. 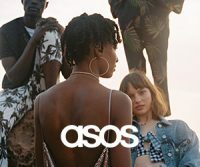 They’ll look so chic at weddings and summer parties, but I would also style them with with some light wash cropped denim jeans, a oversized white shirt and a white bag to finish the look. New for AW17, these kitten heels are perfect example of understated elegance, a classic design that feels totally modern. They are pointed and have a strappy silhouette with a buckle-fastening slingback strap. I picked these black pair as they will go with a whole variety of styles. Thank you for reading, do let me know what your favourite kitten heels are by leaving a comment below. Love all your choice of kitten heels! Each one of them is so stylish. One more reason for me to love kintten heels is that they don’t hurt my feet as much as the stilettos.